The United States government was shut down on January 20th because the two partied could not reach a deal on the status of the Dreamers, the nearly 800,000 immigrants enrolled in the Deferred Action for Childhood Arrivals (DACA) program. DACA was enacted by the Obama administration in 2012, and it extended protections to certain people who had entered the United States as minors and stayed illegally. This program gave them the opportunity to obtain work permits and legal standing in the country. Donald Trump became President of the United States in January 2017 and he made clear that he would be repealing DACA. In September, he made an abrupt announcement that the protections provided by DACA would be rescinded, throwing the lives of the immigrants enrolled in it into turmoil with no clear end in sight. 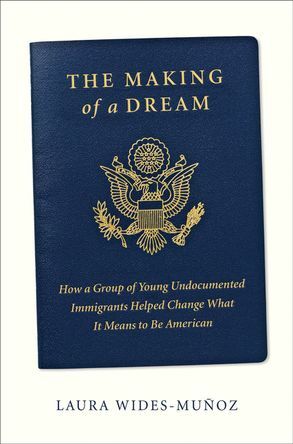 Laura Wides-Munoz, the Vice President for Special Projects & Editorial Strategy at Fusion Magazine, in The Making Of a Dream: How a Group of Young Undocumented Immigrants Helped Change What It Means to be American, delves into the story behind DACA and what has become the next chapter of civil rights in America. Hareth Andrade is the face of a new generation of undocumented immigrants, no longer limited to the nation's border states and gateway cities. At eight years old, Hareth and his younger sister are sent to live with their aunt in the United States just weeks before the September 11, 2001 attacks. Slowly, they rebuild their lives in their adopted country until a tragic mistake threatens to destroy their family and thrusts Hareth onto the national stage. She currently lives in Arlington, Virginia. Marie (Gonzalez) Deel arrived at age five with her parents from Costa Rica. She grew up in Missouri and sees herself as a midwest American girl until immigration officers come knocking at her family's door and she becomes the face of a burgeoning movement. Later she struggles with her desire to be part of the movement but also to finally enjoy the normalcy she has spent so much of her life fighting for. She lives in Albuquerque, New Mexico. Felipe (Matos) Sousa Rodriguez was born near the favelas of Brazil and arrived in Miami, Florida, at fourteen years old. Forced to come out twice, first as an undocumented immigrant and later as a gay man, Felipe discovers his voice and true love along the way, making himself an inspiration for thousands of other young immigrants. He lives in Orlando. Dario Guerrero is now a Harvard University film studies major with a lot to prove after he enjoyed a sheltered childhood in Los Angeles despite his status as an undocumented Mexican immigrant. When tragedy struck, he was caught between his all-American Hollywood dreams and the immigrant reality he can't escape. He lives in the Los Angeles area. Edgar "Alex" Aldana also hails from Mexico, and arrived in the United States at a bit older age, 16, from Mexico. That makes him ineligible for the DREAM Act or DACA. In lieu of college, Alex becomes a Los Angeles activist, confronting not only those who seek to deport him, but also challenging the tactics and philosophy of some in his own movement. He lives in the Los Angeles area. history like 9/11, the wars in Afghanistan and Iraq, the progress that was made in the Obama administration, and the resurgence of the anti-immigrant right. Wides-Munoz writes of Andrade and how she relates to other cases like hers, "Hareth would grow up part of a generation of young immigrants often collectively known as the DREAMers; kids raised in a country whose language and culture they identified with, whose pledge of allegiance they recited every morning in school - and yet a country that sought to render them akin to ghosts the moment they become adults, making it impossible for most to seek a college education, work legally, or have any official say in the political system. But these teens refused to become ghosts; to hide as their elders had. And ultimately, despite their immigration status, or in part because of it, many have become among the nation's most politically engaged young citizens - in all but name. "Some, like Hareth, have fought for change overtly, sharing their stories with countless other youths and lawmakers, advocating for immigration reform. Others have taken a stand through the simple act of demanding to be recognized for their contributions to the country. Some have worked within the system, and some have pushed up against it. No one person has led the fight, nor have these young immigrants done it alone. But over the course of two decades, they have effectively shaped the debate over who should be considered an American, forcing the United States to recognize the millions of people working in the shadows to keep this country's economic engine humming. They have demanded difficult conversations be had about the future of our country, and they have faced opposition in the nation's most powerful Washington corridors. In truth, it remains to be seen how their story will end and how many will be forced to leave their adopted country before it does, but in many ways, the millennium is where their story begins." George W. Bush won a tight election against Al Gore in 2000, and even though he is a Republican, he was a lot more sensitive to the plight of immigrants than the current occupant of the White House from that party. On how Bush was viewed by immigrant advocates, Wides-Munoz writes, "The inauguration of George W. Bush seemed in many ways like the answer to the prayers of immigrants and their champions. The new president's brother (Jeb) was married to a Mexican immigrant, and a month after taking office in 2001, Bush announced plans to visit Mexican president Vicente Fox. By July, Bush's administration floated the idea of a new amnesty program for Mexicans and an expanded guest worker program for those harvesting the nation's crops, tapping Secretary of State Colin Powell and Attorney General John Ashcroft to look into legalizing 3 million to 4 million Mexican immigrants, and possibly millions from other countries as well." One event happened that changed the country's views on immigrants and stopped this incredible progress, the September 11th attacks, which led to the passage of the Patriot Act and the passage of a bill in Congress to increase border security and improve the exchange of criminal and visa information across agencies. On that period, Wides-Munoz writes, "Americans felt vulnerable in a way they never had before. Across the nation, the fear opened new space for the expression of long-simmering resentment of some Americans about the increasing number of Latino, Middle Eastern, and Asian immigrants, who brought with them non-European traditons and whose arrival had coincided with the increasing number of blue-collar jobs lost to both global outsourcing and automation." It was this feeling that Trump exploited to win the Republican primary against Jeb Bush and others who were open to paths to citizenship for Dreamers. In the general election, Trump deemed Democratic candidate Hillary Clinton weak when it came to national security issues. In addition to the stories of those five heroic Dreamers, Wides-Munoz also tells the stories of nationally recognized immigrant activists Tania Unzueta, who lives in Chicago, and Erika Andiola, who lives in Washington, D.C., and the founders of United We Dream, Cristina Jimenez and Julieta Garibay. On how she feels the immigrants of today should be viewed, Wides-Munoz writes, "And although man Americans might still distinguish the DACA-protected immigrants from their parents and even their peers, the very recognition of their claim to the American dream, the recognition of their humanity, has changed the broader conversation. It has forced an unwilling nation toward a reckoning of the roles played by millions of other undocumented immigrants living in the shadows. "Regardless of whether they finally achieve a legislative victory, these young leaders have already claimed a cultural one, redefining not only the terms of the immigration debate in the United States but also the definition of what it means to be an American." The Making of a Dream is a vitally important resource at this moment in American history, as the fate of the Dreamers is linked to President Donald Trump's dream of a wall on the Mexican border, and whether he can get Congress to fund the construction. The future of the United States, and whether this country remains a beacon to the world, is on the line.